Cardiff Met student Jackson Price is in the Great Britain team for the 29th World University Winter Games in Krasnoyarsk, Russia in March 2019. Centreman Price, who plays National League hockey for Cardiff Fire, is in a GB team of 58 athletes and support staff going to Russia. Swindon-born Price, 22, is in the ice hockey team, while GB also compete in curling, speed skating and snowsports (ski-cross, ski-slopestyle and snowboard cross). 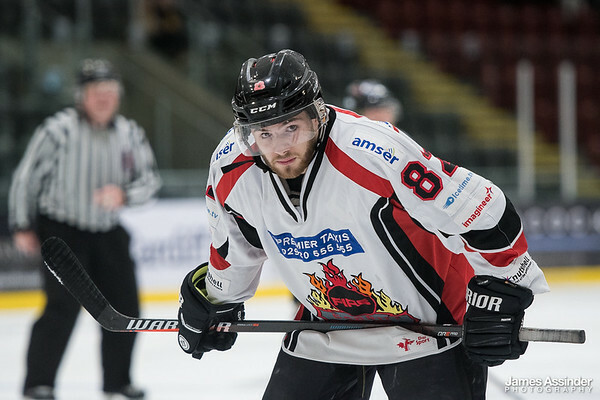 Price, who played in all five games at the 2017 World University Games in Kazakhstan, is a tenacious centre who has played for Cardiff Fire over the last three seasons. Cardiff Fire centre Jackson Price has been selected to play fro Great Britain at the World University Games in Russia. Pic: James Assinder. The Great Britain student team is made up of 38 athletes from 26 universities and colleges. The student athletes range from undergraduate and masters students studying a variety of courses including mechanical engineering, biochemistry and industrial economics. They will be supported by a 20 strong team of support staff including the HQ team, doctors, physios, coaches, assistant coaches and team leaders. The competition starts off with the opening ceremony on Saturday, March 2 and runs for 11 days across 10 venues. Action: Cardiff Fire v Guildford Phoenix. Pic: James Assinder. Price played for Cardiff Fire as they suffered a second defeat in two days, losing 5-0 against Oxford City Stars at the Viola Arena in Cardiff Bay, one day after slipping up 5-1 against Guildford Phoenix. Shots on goal: Fire (on John Dibble) 38, Stars (on James Whiting) 44. Scorers, Stars: Tom Davis 1+2, Lee Richardson 1+1, Conor Redmond 1+1, Michal Dravec 1+0, Joe Edwards 1+0, Joshua Florey 0+2, Alexander Staples 0+2, Dominic Hopkins 0+1. Period scores (Fire first): 0-3; 0-1 (0-4); 0-1 (0-5). Penalties in minutes: Fire 16+2+6=24; Stars 0+8+12=20.